The irritating imperfections of others may actually be strengths. What follows is a short list of irritating imperfections that drive me crazy. Your list would likely be different. Taking too long to make decisions. Just go doing something, for crying out loud. Waiting for permission. You’re smart and capable, what are you waiting for? Obsession with what others think. Being task-driven, rather than relationship-driven. Being so nice that you don’t say what you really think. Not being upfront with your agenda. Manipulative people drive me crazy. 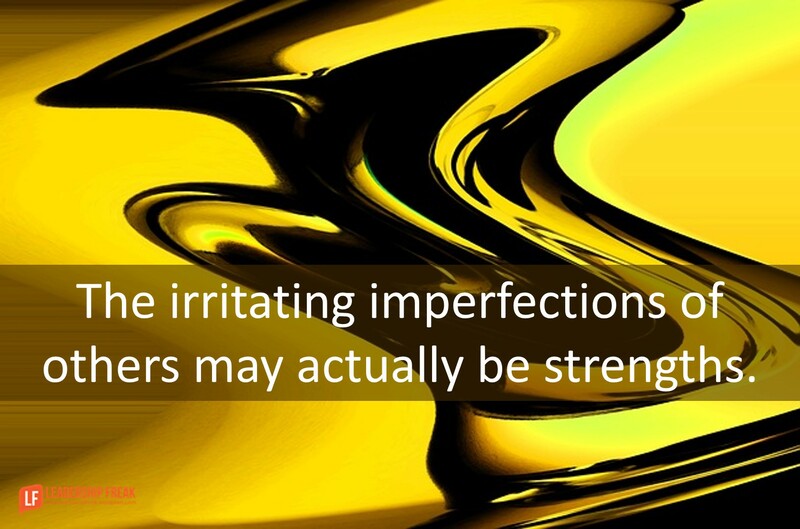 Irritating imperfections may be strengths. An irritating imperfection may have a useful side. You can’t maximize someone’s strengths and disapprove of them at the same time. An irritating imperfection for one is a strength to another. Perhaps introverts irritate you. In order to maximize their strengths, you must accept their differences. Taking too long to make decisions is exploring options and building confidence. Obsession with what others think is sensitivity to how decisions impact others. Playing not to lose is protecting gains. Task driven leaders get things done. People who are different from you, are the ones with the most to offer you. People who are like you, affirm you. The people who are different from you, expand you. Learning from others begins when you accept their irritating imperfections. Consider the advantages of another’s perspective. An irritating imperfection may be a strength. Focus on what you like about others. Remember the contributions those irritating others make. Where would you be without them? Place people in roles where their irritating imperfections find useful expression. Leaders may be tempted to resist, reject, or judge irritating imperfections in team members. Judging people by our strengths ends in a ‘my way or the highway’ approach. How might leaders maximize the irritating imperfections in others?